Farmers overwhelmingly support Donald Trump. They represent the nexus of white Americans facing tough economic times. 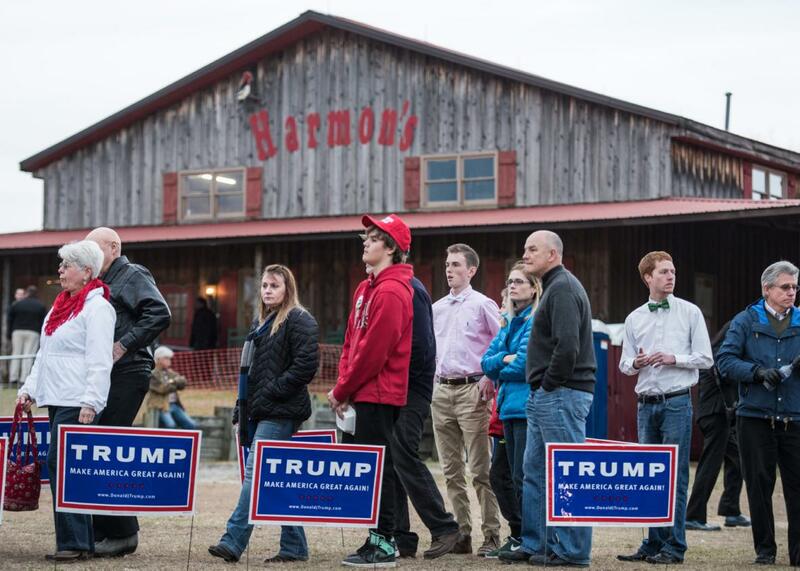 People wait in line at at a Donald Trump campaign rally at Harmon Tree Farm on Jan. 27 in Gilbert, South Carolina. This story originally appeared on Mother Jones and is reproduced here with permission from Climate Desk. As the election lurches into its final days, Donald Trump’s electoral prospects are as voluble as the man himself, one minute receding into the same fog that once claimed Trump steaks and other failed enterprises; the next, buoyed by a surprise lurking in a disgraced former congressman’s, uh, “device,“ and a Republican FBI chief’s strange decision. Meanwhile, Donald-mania burns bright among at least one subset of the population far from the rollicking events in Washington, D.C.: farmers and ranchers. According to a new poll by trade journal Agri-Pulse, conducted Oct. 5 to Oct. 18, Trump leads Democratic rival Hillary Clinton by the commanding margin of 55 percent to 18 percent among farmers with operations of at least 200 acres. Of the rest, 15 percent were undecided, 8 percent declined to answer, and a combined 3 percent supported third-party candidates Gary Johnson and Jill Stein. While farmers make up a tiny part of the national electorate—there are about 662,000 farms that are more than 180 acres in size, according to the latest U.S. Census Bureau numbers—they actually could make a difference in the election in a key swing state: Ohio, where Trump enjoys the support of 68 percent of farmers, the poll found. Why would a lifelong urbanite who splits his time between Manhattan and Palm Beach (shuttled to and fro on his private jet) enjoy such robust support in the heartland? * The answer may lie in The Donald’s unmatched ability to deliver an angry, frothing rant. The Agri-Pulse poll finds that 86 percent of respondents reported being somewhat or very dissatisfied with the way things are going in the United States. (That’s even higher than the 70 percent rate found in Gallup’s latest poll of the overall U.S. population.) On a question about the “overall state of agriculture today,” “dissatisfied” trumped “satisfied” by 60.4 percent to 37 percent, the poll found. 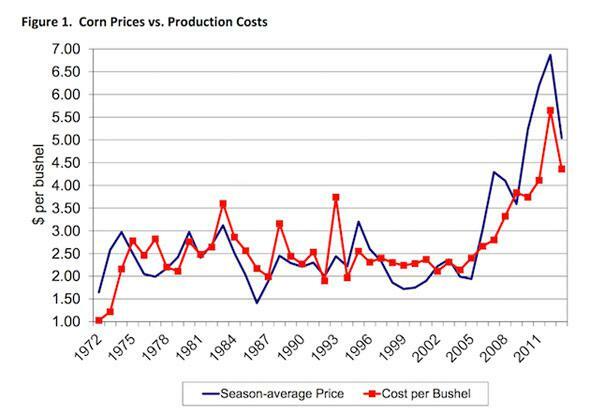 As for the farm economy, this U.S. Department of Agriculture chart tells a story of long-term stagnation, briefly interrupted by the government-engineered ethanol boom from 2006 to 2013. 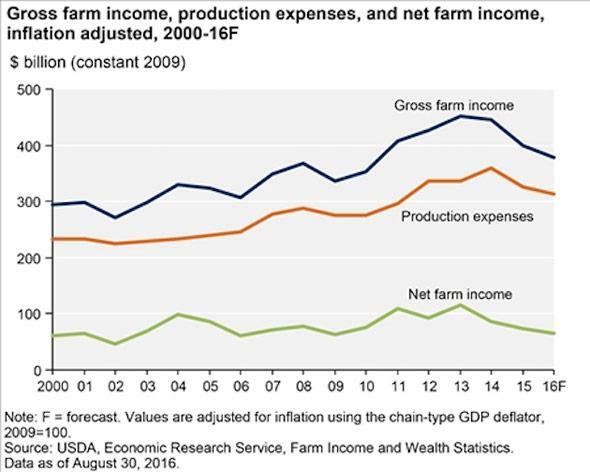 Look at the bottom line—“net farm income,” which measures what farmers take home after expenses.